Race and Real Estate brings together new work by architects, sociologists, legal scholars, and literary critics that qualifies and complicates traditional narratives of race, property, and citizenship in the United States. Rather than simply rehearsing the standard account of how blacks were historically excluded from homeownership, the authors of these essays explore how the raced history of property affects understandings of home and citizenship. 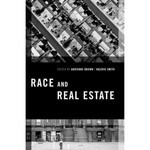 While the narrative of race and real estate in America has usually been relayed in terms of institutional subjugation, dispossession, and forced segregation, the essays collected in this volume acknowledge the validity of these histories while presenting new perspectives on this story. Professor Bell's contribution, chapter 3, is titled "Hating the Neighbors: Minority Housing Integration and Racialized Boundaries." Available as an ebook to Indiana University-Bloomington patrons here. Available as an ebook to Oxford Scholarship subscribers here. Bell, Jeannine, "Race and Real Estate (edited by Adrienne Brown and Valerie Smith)" (2015). Books by Maurer Faculty. 164.